I had quite the 3-day weekend of game-playing. 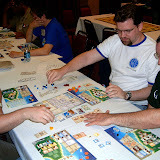 On Friday and Sunday, I went to EuroQuest, a board gaming convention north of Baltimore. I am trying to catch up with the modern web. Instead of posting most of the pictures here, I'm putting them in a web album which you can see by clicking above. I had a good time at the tournament, playing a couple of new games as well as some old favorites. I qualified for the semi-finals of the Puerto Rico tournament. At that point, I discovered that I was not into the whole tournament experience as much as the rest of the players. I probably would have been happier sticking with "open gaming". One of the odder experiences I had at the tournament was running into three brothers who went to my high school, including one I who was my debate partner at the 1987 debate nationals. Of course, I also ran into two other people from my high school, but seeing Paul and Martin is a more expected, but still enjoyable, experience. I left early on Friday because Christina and I had been invited to a surprise 40th birthday party for someone. The gaming tie-in there is that people started playing Karaoke Revolution. Christina and I did a duet of Love Shack -- fortunately the female lead has more lyrics, so we were able to complete the song. On Sunday, I participated in the first UMBC go tournament. I came in first in the weakest division with a 3-1 record and took home a book as a prize. I think I moved up from 19 to 18 kyu there, so I'll have to study the book hard if I want to do well at next weekend's tournament.